It was a heavy rainy day when I visited the sake factory in my home town of Kure. I went to that store after, I don’t know, several years, and it had not changed at all. 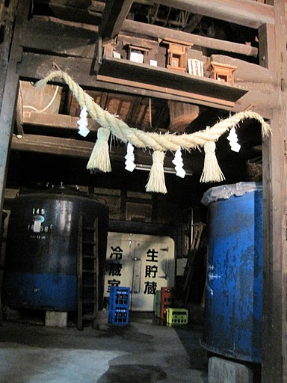 It’s an old Japanese building and at the front of the factory hangs a brown sakabayashi the symbol of sake making. The sakabayashi is made of pine leaves and it has a spherical body. People hang up it when young sake is made. When it is new, the color is bright green, but as it gets older, the color turns to brown. The door was open, and when I enter the factory, there are many kinds of Jizake, some implements for making sake and the faint smell of rice wine and age. Because there were no people, I went to the back room there, two madams, were talking loudly. I tried talking to them, “Suimase—n!” Then one of them noticed me, and I started my research. There are many kinds of sake which are local to places in Japan. They are called “Jizake”. People have long felt familiar with Jizake. People in Kochi really like sake. There are cups which have small holes, others with strange shape that can’t be put on the table (which are called “Bekuhai”). This cup is purpose is make people drink a lot. There is also “Henpai” in which people share one cup and trade drinks endlessly. In addition, Kochi is very famous for sake culture. Kochi’s sake has a strong and unique image. Jizake in Kochi also has particular characteristics. There are many sake factories in each prefecture in Japan, and each prefecture has its own taste. There are 18 Jizake factories in Kochi. I visited one of these sake factories, Nishioka Shuzou in my home town, Kure. In the selling space, there were pictures draw with scenes of people making sake in ancient times. They are all men, and they wear old Japanese clothes. Some men wear only loincloths and set about their work very seriously and powerfully. It is two hundred and thirty years since this factory was established. In ancient times, there were no machines for making sake, so they made sake all by hand. Now, there are many convenient machines so people can make sake more easily than before but in ancient times, everyone had live in the factory and made sake. Past the selling place is the brewery itself. When I visited,it lay sleeping as no sake is made in the summer season. The best season is winter and they can make very good-tasting sake. I could see around the brewery freely and then I saw a lot of Japanese apricots in a big receptacle (to wash?) I didn’t know the reason. However, there were boards in which is written how to make sake. First,rice cleaning. It is called Seimai. Seimai is a work shaving off outer brown rice. Then, the polished rice is washed to reduce a lot of dirt and rice bran, and rice include water is steamed for about one hour. After that, Koji and Shubo are added Koji is a preparation obtained by growing a kind of mold usually Aspergillus oryzae on boiled rice, barley, soybeans etc., used as a starter for the fermentation in sake and soy-sause production. Syubo is the yeast sterter for a batch of sake. We need a lot of unmixed syubo when we make sake. And then Moromi is made. Moromi is the unrefined sake. Finally, it is squeezed, filtered and Matured. Deep in the brewery, I could see a room for laying Jizake down. At the entrance, there are kamidana which is a shelf to deify the god. I felt the place is very sacred and understood how people preserve a tradition carefully. Jizake is a important product for local people. However, in recent years, young people get don’t drink rice wine. Many sake brewing company have gone bankrupt and their production get decreased. Actually, sake factories in Kochi decreased from 31 to 18. Now, people make an effort to revive Jizake. Kikusui shyuzou, for one, in Kochi is producing new kinds of sake such that use Kochi-grown ingredients. Surprisingly, consumption number of young Kochi women drink sake more than men. Because of this, women invent sake which suite to customers’ (especially women’s) needs. For example, ume brandy include collagen, sake which is honey-ferment and it is origin of the word “honeymoon”. Men don’t come up with these kinds of sake. As a Japanese person, I want people drink Jizake more and more because it’s a symbol of the place, and super tremendous people for ages, have worked painstakingly to produce this wonderful drink. Next Ice Crin? Ice Cream? What’s the difference? You must have resarched a lot. What Tsurayuki Kino said was really funny! Thanks for the interesting article about Jizake. I went there last year for the festival the hold for the first sake of the year. It was a lot of fun but, unfortunately, I don’t really like sake, so I was the designated driver, or ‘Des’ as we say in Australia. Good job researching and writing such an intersting article. The first nice drink I had in Japan a couple of years ago was Jizake – I had it in Kyoto though, where it was popular. Your article made me remember that experience. I will want to drink Jizake in Kochi.